We have had some crazy weather here this week and it started Monday night with a fabulous wind/thunderstorm that knocked out our power and phone for 16 hours and we lost one tree. The light show that went along it this storm was non-stop at 4am and it was raining sideways! Then it cleared up Tuesday and was hot and humid so we spent the day swimming...it was nice to have the kids off the TV, computer, etc the whole day! Then came more rain for the next two days. We have had so much rain that our lake has risen about 5 inches!! I know that based on how high the water level is on our steps at the dock. The bottom step here is usually about 2"out of the water, now it is 2" under water! And the water is now touching the bottom of the dock. Our little fishing boat is sitting so high too, usually the top edge of the boat is just above the dock. 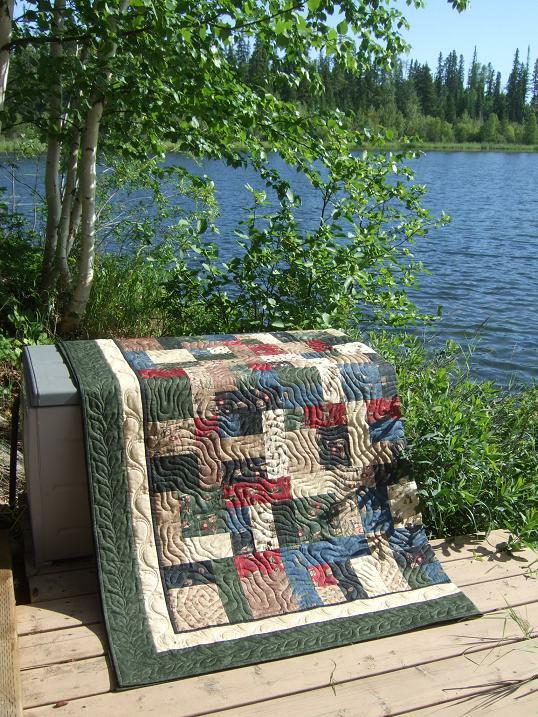 I have had clients drop off quilt tops and say that they are not happy with the quilt top they made but want it finished and then when they see it quilted they just love it. So I told my Mom she is not the first one to react this way. I quilted it using my free hand Topo design and free hand leaves in the border. Wool batting and So Fine thread. My Mom just said the pictures don't do the quilt justice, the colors are much more vibrant in person. 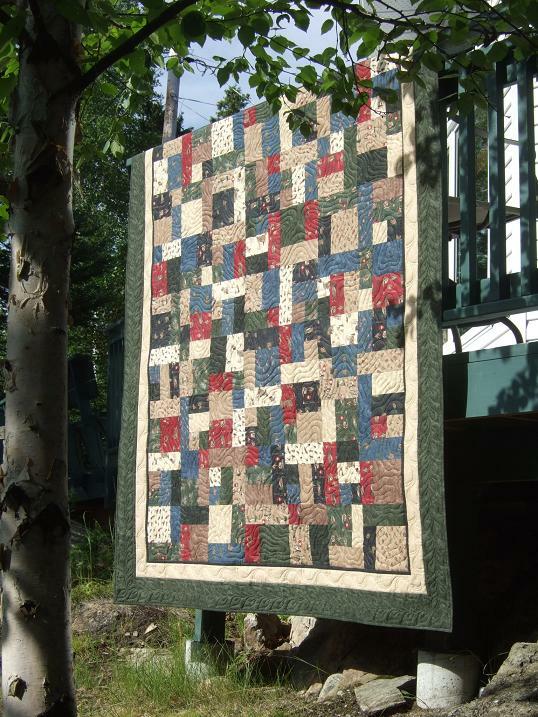 This quilt is gorgeous....I love the leaves in the border and that pattern in the center is really fun. I've made quilts too that I don't like very much and then quilt them and love them. It's weird how that happens. 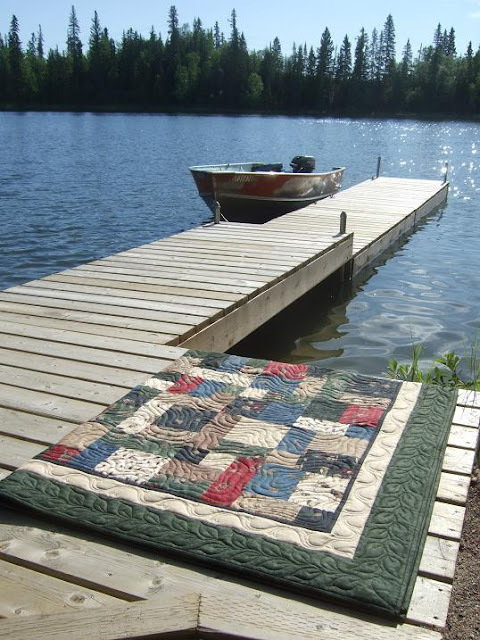 Sometimes the quilting makes the quilt. Thanks for sharing your beautiful talent with all of us. Great pictures. 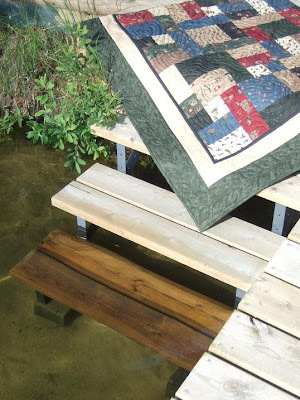 I love your quilting design. Love this post Kathy! Your place is so gorgeous and the quilt is beautiful! Isn't wool batting a dream to quilt with. I really like your design in the inner border! My kids would love a storm like that, we've never lost power and I think it would be so much fun...at first!! Wow - this is a really terrific quilt. I love your topo quilting. I'd love to learn it and add it to my repertoire. Is it like a wonky, wiggly spiral? Looks so nice with the border designs, too. 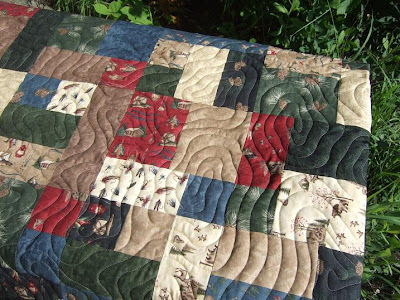 You are right, the quilt can look so different after the quilting. 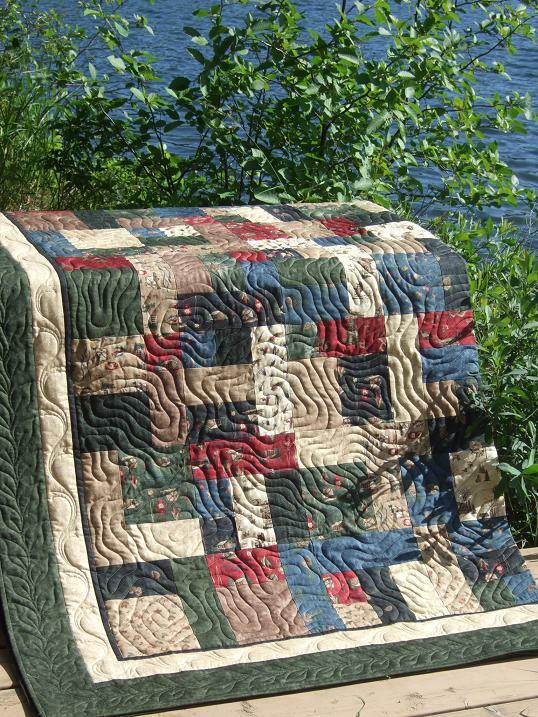 Your mum's quilt is beautiful, and your freehand quilting really enhances it. I really like what you did in the cream border. Yellow Brick Road is a favorite of mine! Love the colors you chose and I really like the Topo Quilting Design!! Your lake looks so beautiful, like I could just jump in, thanks for sharing. Fabulous scenery and a quilt to die for. Love it. I really love what you did with this Yellow Brick Road pattern, the colours are great, but it's really the quilting that gives it life! I love your freehand design and especially love those leaves in the border. It all goes together so well and compliments each other. You have such a great eye, my friend. Quilt on! Love your quilt and the pattern. I have been looking for this pattern and I see so many different versions out there. Where can I get this pattern?